On September 16, 2016 the chairperson of the Senate Select Committee, Senator Connie Leyva, held a Hearing to take testimony in an effort to see if the public agreed with the findings of the Committee: manager abuse is rampant in California and there is a dire need to require managers have some training and perhaps be certified. The October issue of COMO-CAL’s “The Connection” will feature the Hearing, some of the testimony given, and COMO-CAL’s response. Until that time, you can provide some useful information if you take the following SURVEY. We thank you in advance! COMO-CAL, under new leadership, rejoined the national group – National Mobile Home Owners Association (NMHOA) and three board members attended their Convention in Las Vegas. Details in November COMO-CAL’s The Connection. Ken, Sam and Paul have hit the ground running. Ken and Sam attended Senator Leyva’s Hearing in San Bernardino on September 16th, and all three attended the national group (NMHOA) Conference in Las Vegas. Rose is behind the scenes working to transfer the bank account to Sam and Ken. Miguel Aranda, et al. v. Terrace View Partners, L.P.
Today, a San Diego civil jury awarded 10 households of the Terrace View Mobile Home Park $58,389,000 in compensatory and punitive damages against the Park owners, Tom Tatum & Jeff Kaplan. The case involved charging unreasonable rents and other illegal practices causing residents to lose their homes. At the time of trial, 100 of the 200 spaces at the Terrace View Mobile Home Park were empty or abandoned due to the park owners’ practices. This is the first phase of 49 homes that are part of the lawsuit. Please contribute to Mobilehome Magazine (www.mobilehomemagazine.org). Simply click on the GoFundMe link: gofundme.com/2cc29pmk. We thank you for your support. Watch for the new MH Life Magazine, coming August 1st. Questions? Call, or email Frank Wodley at 818-886-6479, fawodley@yahoo.com. Remember, we serve all mobile/manufactured home owners in California! Congratulations on a successful GSMOL Convention. We’re especially happy to see the One Member One Vote pass. It is step towards a democratically run GSMOL, which we’ve always favored. And it was a pleasant surprise to see you’ve hired Esperanza Ross to replace Brian Augusta as lobbyist. It is critical that GSMOL spearheads efforts in Sacramento on behalf of the mobilehome owner community and we understand Ms. Ross is anxious to be involved. Recently COMO-CAL presented a Survey to several hundred in the mobilehome community. One topic was transparency, which we feel is critical to any non-profit’s success. We understand GSMOL Convention delegates voted to begin publishing a current financial statement in every upcoming issue of the Californian. We support and applaud this 100%. Many of over the years have asked this be done (it was also common to see financial statements in the Californian during the early years). Members need to trust their leaders and providing members critical information about the status of GSMOL can only lead to better relations between the GSMOL BOD and GSMOL members. And we know it will improve the relationship between COMO-CAL and GSMOL. Nice job! Most folks don’t remember what happened in 2009. That was the year when lobbyist Maurice Priest left GSMOL. He was replaced by Christine Minnehan and Brian Augusta and their hiring led to three Summits in early 2009 between GSMOL, COMO-CAL and other advocates. The goal of the Summits was to get all of us on the same page, at least with regards to legislation. We think, for the most part, it was successful. COMO-CAL and GSMOL communicated and worked together for a common goal. We stood as one, promoting legislation that would help mobilehome owners and opposing legislation that would harm mobilehome owners. We feel, with the hiring of a new lobbyist, i.e. Esperanza Ross, our organizations have another opportunity to work together. Not only would it be a win-win for GSMOL and COMO-CAL, but it would be a win for those we serve, namely the mobilehome owner community. That being said, we propose GSMOL and COMO-CAL immediately start a dialogue. The goal would be to set a time, place, and an agenda convenient to both organizations, to once again meet and confer. After all, nothing ventured, nothing gained. And perhaps we can find other areas of mutual interest where we can work together. The community wants and needs us together, not divided. Again, congratulations on your Convention. We look forward to working with you in the future. Please participate in a very important Survey just released if you have an opinion on MHLife’s articles on GSMOL. It is an important Survey, consisting of 10 questions. Please go to https://www.surveymonkey.com/r/5KG2ST7. We thank all who participated in our Survey two weeks ago. Thank you. The Survey of April 6, 2016 is now closed. We thank all who participated. The results will be published in the June MH Life Magazine and on this website. Thank you again, this was a very informative Survey. We just mailed out our new Survey on Transparency and Enforcement. Please go to: https://www.surveymonkey.com/r/8DQNY9H. We value your opinion and appreciate your time. 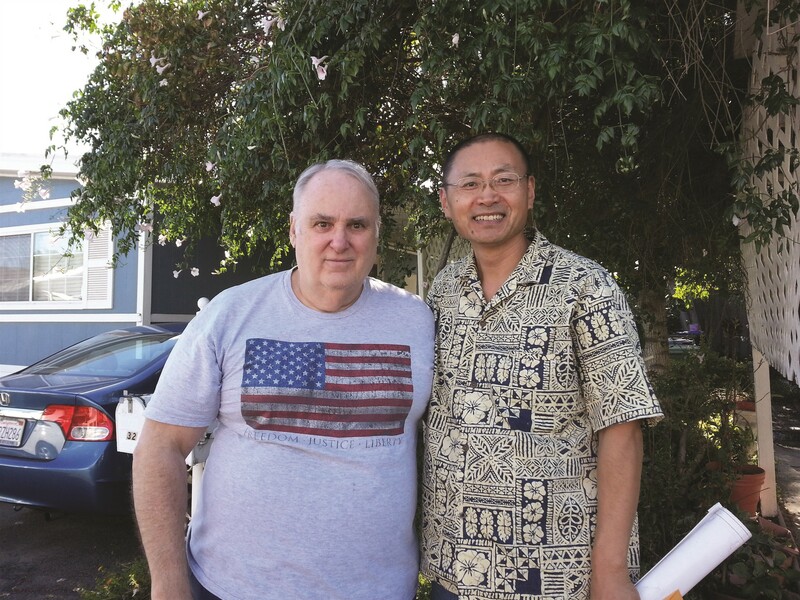 We are very excited to announce that John Bertaut, ex-GSMOL VP and his group (Sacramento Area Coalition of Mobilehome Owners) have accepted our offer of a FREE magazine to help them with their advocacy. They will give the magazine a new name and use it to publish information for residents in the 15 or so parks in their Coalition. We see this as a beginning of our Regional Group Plan, and UNITY (groups will act independently, but share and network via the magazine). John’s Sacramento magazine, as well as others once they come on board, will be displayed on a new website, perhaps titled United Mobilehome Owners of California. Now your advocacy can have a voice via the magazine. We will offer the magazine FREE to any advocacy in California who serves mobilehome owners. All we ask is for you to be transparent and responsive to those you serve. Call Frank for details (818-886-6479). We especially would like to see our friends in San Jose and Hemet get on board. Lets work together. COMO-CAL held their first meeting to address forming Regional Groups around the state of California. We’ve been writing about reorganizing advocacy groups since November 2014, and now it is actually happening. We met at Frank Wodley’s park – Chatsworth Mobilehome Park, in Chatsworth (L.A. San Fernando Valley). Attending were representatives from San Marcos (Lloyd Rochambeau, President of SMMRA (San Marcos)), Carol Spizzirri Vice President of SMMRA, Floyd Folden (Oxnard), Paul Masminster (Save Our Souls – Torrance), Jerilyn Schimandle (Sylmar), Frank Wodley (President of COMO-CAL) and Ken and Sam Meng (MRA 1441 – Rowland Heights). The meeting began with an update on the crisis brought about by the demise of GSMOL and the loss of the lobbyist,Brian Augusta, who represented MH owners interests in Sacramento. Our efforts, to warn the Community that this was inevitable unless action was taken to remove the “bad apple board members” leading GSMOL, fell on deft ears. Had the Community acted on our alerts, and had GSMOL leaders embraced our suggestions and assistance, GSMOL would still be viable today. Now it is too late. Two Vice Presidents have resigned because they encountered a majority board much like that described in George Smith’s Lawsuit in 1999. Their resignations validate what we have been saying all along – GSMOL is being run by a small group more interested in themselves than MH owners. They have conspired to deceive MH owners into thinking GSMOL is “alive and well,” and that they have been doing a terrific job, when in fact GSMOL has been losing members and income since the late 1980’s. Today it is out of money and won’t survive. The latest Californian is another example of their deception. There is NO MENTION of any crisis in GSMOL. It is “business as usual.” When in fact it is very far from “business as usual.” Those leaving predict GSMOL can continue only a few more months. Contrary to misconceptions by some, there have been times when COMO-CAL and GSMOL worked very well together. GSMOL’s focus has always been Sacramento (after all that’s why they are a 501(c)4 – a nonprofit that can lobby). 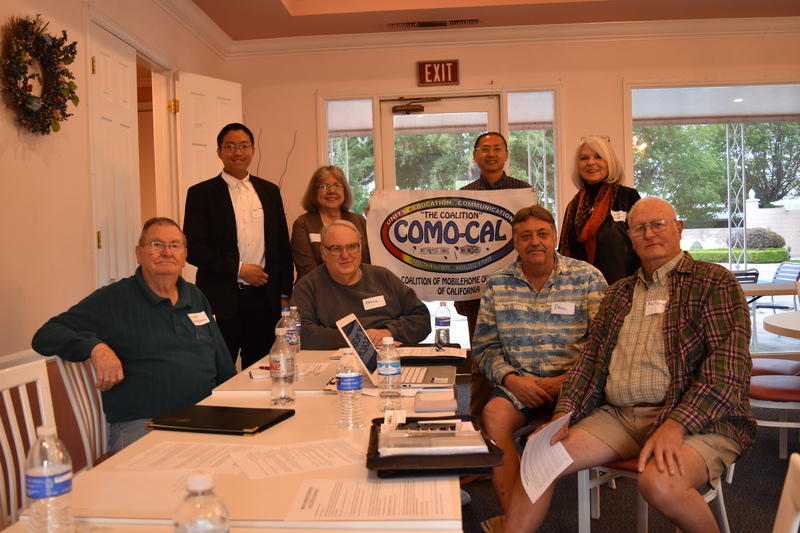 COMO-CAL’s focus has always been grass roots, working with HOA’s and residents on issues they face in their parks (COMO-CAL is a 501(c)3 – we are a nonprofit that can not lobby). The loss of a lobbyist, representing our interests in Sacramento, should be a huge RED FLAG to all MH owners in California. The Community simply can not afford to turn a blind eye anymore. This can soon have HUGE CONSEQUENCES if we do not UNITE and work together. The balance of the meeting focused on The Regional Group Plan. The RG Plan works. It gets advocates working together for the first time in many years. It eliminates competition. Regional leaders now have the resources to really make a difference in their area. No one is telling them how to advocate. No one is taking money from their members. Each Regional Group (RG) works independently of the rest of the state. Each RG communicates, networks, and shares with all other RG’s. NO ONE IS AN ISLAND. The Magazine will continue to be the life blood of the RG Plan. Each RG would have its own Magazine. Regional leaders will rename it to suit their area and focus. Each RG would decide how they would advocate: a) whether or not to have members, b) what issues to deal with first, c) a resolution process, etc. Monies collected will be used by the local RG. If and when there are enough resources to hire a lobbyist and/or attorney, all RGs will contribute their share. We suggest all RG leaders take the Pledge to be transparent and open (financial statements), responsive to members, and agree to network, share and communicate with all other advocates. We see no problem starting a Regional Group for L.A., Orange County and North County San Diego by June 2016. And we hope our efforts here in Southern California will be embraced by advocate leaders in Northern California. We can no longer afford to be divided. Strength in Numbers. Our hope is all MH owners get behind our efforts to UNITE. We have taken Updates off the HOME page. You can now find important updates on the menu above. Much is happening to advocacy today and you should be informed by visiting UPDATES on a regular basis. I am the founder and president of the 1441 Manufactured-Home Residents Association (MRA1441), which was formed to serve residents and improve our community. Our family moved into Rowland Heights Mobile Estates in July, 2012, after our home was foreclosed in 2011. 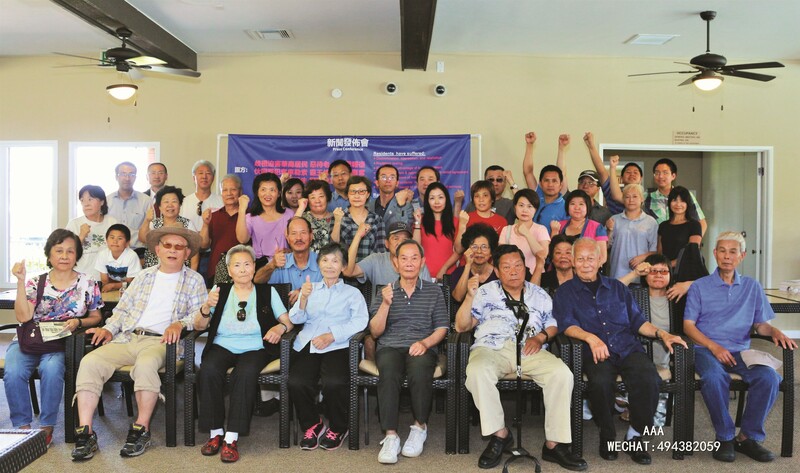 By the time we moved in, we found residents were being discriminated against and oppressed by park management, and many of the elderly were complaining that living at Rowland Heights ME was like living in a jail. 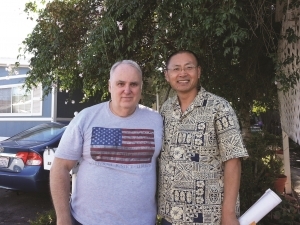 Photo: Ken Meng (right) with Frank Wodley at Frank’s home in Chatsworth. In early 2013, MRA1441 was created. In May, we organized a protest, and at the end of the year, after much research and hard work, organized a meeting with the park owner. We represented over 175 residents. As a result, the park owner finally decided to replace their abusive management, did not raise the rent on residents for one year, fixed the roads, extended clubhouse hours, and made other improvements. By organizing residents, we overcame retaliation and profoundly learned that when vulnerable residents unite, they become powerful and are then able to protect their rights. Residents in one park can only do so much, so we began reaching out to other mobilehome organizations. Although we did not receive effective help from GSMOL, we did connect with COMO-CAL after reading a copy of MH Life Magazine. We appreciated the Magazine for courageously standing up for residents, and pointing out problems in California mobilehome parks. Through much contact with Frank Wodley, we found him to be honest, enthusiastic, hard working, he disregards personal gains, and is a person who strives to do his best. At one time he was a manger with GSMOL, however he was concerned about the lack of enforcement and the direction of the organization. Therefore in 2004 he decided to form COMO-CAL and MH Life Magazine. The Magazine is the only publication telling the truth about advocacy and issues found in mobilehome parks. We clearly recognize that Frank Wodley’s efforts and selfless dedication are due only because of his desire to help a vulnerable group of residents receive just treatment. COMO-CAL’s Regional Plan effectively helps residents, but only if residents support it. Individual park associations are the foundation of the Regional Plan. This organization motivates residents to stand up, through unity, to resolve specific problems found in their community. The Regional Plan also provides important resources: a legal fund to provide legal assistance and a Magazine to educate and inform. The “organization” fundamentally differs from that of GSMOL. If residents embrace this plan, we predict residents will have a tremendously effective tool for dealing with park owners and park managers. As with MRA, COMO-CAL encourages residents of mobilehome parks to establish their own community resident organizations instead of only depending on protection by another organization or government agency. Similar to unions, it is the only way to protect a vulnerable group like the mobile home residents in California. By putting local residents in positions of power and providing transparency to the group, only people with a true desire to help their fellow mobilehome residents will join in the leadership of COMO-CAL as it provides no other incentive. After reading this endorsement, I encourage you to organize at least a few residents in your park and join COMO-CAL. Even if it is only you for now, COMO-CAL can help inform and educate you and help you organize. You can adopt a name like Manufactured-Home Residents Association for your new group, i.e. a group that promotes the general welfare of residents in your park. And you can make it specific to your park by adopting your parks address, as the Rowland Heights group did (1441). MRA1441 endorses COMO-CAL. California residents should organize and unite through COMO-CAL for the welfare of their future generations and the future of mobilehome residents. Even if you are a GSMOL member or officer, we suggest you embrace the Regional Plan if your true desire is to serve and help residents. The Plan means resources stay in regions where they will do the most good, and gets everyone working together, effectively and efficiently. It provides for Strength in Numbers! Editor’s Note: I’m thrilled to be working with Ken Meng and MRA1441. Through much adversity (these folks are mainly Chinese speaking and are not fluent in English), they have accomplished so much. If you have a computer I suggest you visit their website (http://mra1441.org/). Photo: Members of MRA1441. Photos can be accessed at https://www.flickr.com/photos/110013505@N07/. Each has is a wealth of information including letters from the park attorney and the unlawful detainer action. Next month we will publish more of their story, their demonstrations, confrontations with management, the lawsuit to evict Ken Meng, and how his 17 year old son Sam was instrumental in helping them win the lawsuit. Their determination and perseverance are to be commended. Congratulations Ken Meng, his family, and their residents association MRA1441!